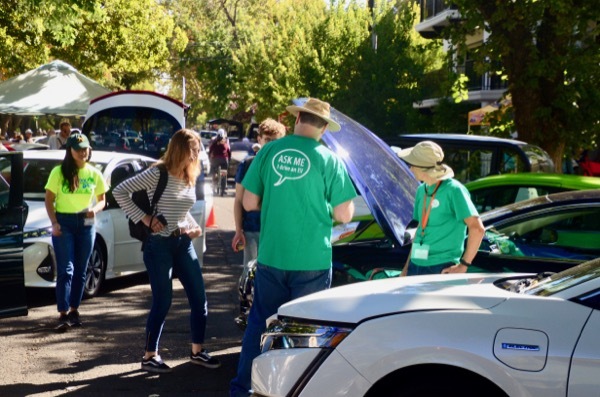 On Saturday, September 15th, SacEV, the Davis Electric Vehicle Association, the City of Davis and Cool Davis hosted a National Drive Electric Event at the Davis Farmers Market with impressive results. Several dealerships (Hanlees - Toyota, Nissan & Chevy; Niello -- BMW & Mini Cooper; Shottenkirk-Honda; Tesla) brought a total of 10 EVs for test drives. Dealership staff gave more than 256 test drives/rides incentivized with Farmers Market Bucks and Gift Cards funded by PG&E. 58 Drivers answered pre and post surveys. In additional to the X and 3 to drive, Tesla brought a display of the Tesla Power wall. Clipper Creek, the CA Clean Vehicle Rebate Program and the UC Davis Plug-in Electric Vehicle Center also shared informational displays and expertise with participants. SacEV, DEVA and Cool Davis members brought 27 personal EVs to the EVent. There were over 1078 separate conversations with community members, as these EV owners shared their EV experiences. Neighbors at Parkview Place, welcomed the E-Bikes for test drives on their driveway! Featured in this special section were 5 different electric assist bikes to test from local partner Kens Bike & Ski. Jump Bike, the new bike share program in Davis, brought 5 e-bikes for test driving too. Community partners Unitrans, Yolo Solano Air Quality District, City of Davis Bike and Pedestrian Programs and Safe Routes to Schools hosted a Transportation Fair for back to school families featuring bus information, bicycle safety checks and information for Safe Routes to school. A 2012 Nissan LEAF was on site as a canvas for kids to express themselves (with dry erase pens), and also a mini-Tesla for kids. Workshops were repeated twice and included: “EV 101,” “EV/PV Driving on Sunshine!” and “Buying a Used EV”. Volunteers gave nearly 850 hours of time to plan/execute the event. Support from the City of Davis and access to this great venue near the Farmers Market was essential to success! Cool Davis intern Sim Bun & DEVA and SacEV owners chat with the EV curious at EVs @ the Market. 27 owner Show & Tell vehicles were on site, with 10 vehicles to test drive along with 10 E-bikes for test drives as well. The Davis Electric Vehicle Association (DEVA), Cool Davis, and Sacramento Electric Vehicle Association (SacEV) are hosting the second annual EVs@theMarket, an EVent to be held at the Davis Farmers Market from 9am to 1pm. Come see the latest electric vehicles and test drive some of the newest EVs. Several dealerships will bring cars for test drives so remember your driver's license. Chat with DEVA and SacEV vehicle owners members about their personal EVs and family electric driving experiences. Registered attendees report 348,456 electric miles driven.